Flickr Launches Android App To Rival With iPhone-only Instagram – One of the biggest photo sharing site by Yahoo, Flickr has just launched a mobile sharing app for the Android which now makes it a rival app to the iPhone-only Instagram app. The Flickr for Android app features various filters effect which you can apply on your photos and then share onto it’s own photo sharing site, Flickr. Besides, user can choose to publish to various social services like Facebook, Twitter, Tumblr and more. It’s just like the Instagram for Android. Another features which stands out is the new Photo Session feature which allows Flickr users to view photos uploaded together. This means that when an user swipe to the next photo, the person who is viewing with also will see the photo swiping to the next photo. At this moment, the app is only available on the Android and only several countries are able to download it. Malaysia is in the list, however it’s not supporting on my Google Nexus One. If you have a newer Android device, do try it out and let me know how is your experience. Feature wise are very good when compare to Instagram, in addition that Flickr is a well-established photo sharing site by Yahoo. 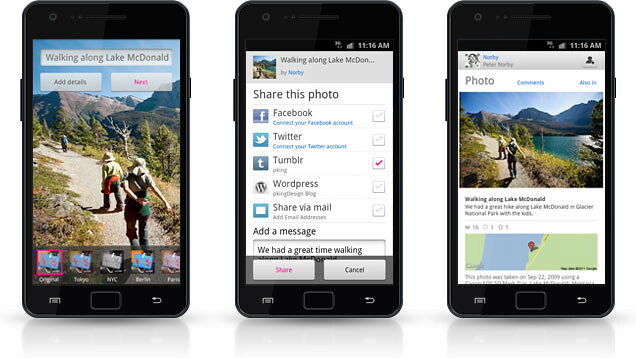 You can download Flickr for Android at Market by searching “flickr yahoo”. Next ArticleLarger Screen And Thinner iPhone 5 On 4th October?